The science fiction series Battlestar Galactica ran for only a single season before being cancelled because of its large budget and falling ratings. Battlestar Galactica tells the story of a group of humans escaping an army known as the Cylons as they try to find their human cousins on Earth. Since the original series was cancelled a spin off show has been produced and a series of remakes, books and video games. The series creator Glen A. Larson attempted to gain financial backing for his story of interplanetary war from the 1960s onwards. The success of science fiction movies, such as Star Wars in the 70s led to American television network ABC and Universal Studios backing the show for production in 1978. Initially Larson wished to produce three two hour movies based on the search for Earth, but following the success of the three hour long pilot 17 one hour long episodes were commissioned. Before being shown in the U.S. a movie version of the series pilot was released in Canada and Japan. Despite high initial ratings for the series the large budget began to cause problems for the series producers; after losing its place as the highest rated show on Sunday nights in the U.S. ABC cancelled the series. In the final installment of the classic series of Battlestar Galactica, entitled The Hand of God the humans who escaped their home planet after it was attacked by the Cylons receive a transmission from Earth. Showing the Apollo 11 moon landings the Battlestar Galactica, the spaceship from which the show gets its name sets off with its armada of human flown ships to find Earth. A sequel entitled Galactica 1980 followed the adventures of the crew of the ship as they reached Earth in the year 1980. A highly successful reworking of the original series was produced in the U.S. in the 21st century. Cast: Richard Hatch, Dirk Benedict, Lorne Greene, Herbert Jefferson Jr. The fate of space warrior Lt. Starbuck is revealed in a vivid dream of teenage genius Dr. Zee. The lives of all Galacticans are in the hands of Troy and Dillon. Troy and Dillon alert Galactica that they are pursuing two enemy Cylons. Earthbound Troy and Dillon rush to the East Coast. Treacherous Xaviar, the renegade Galactican, in disguise sends Troy and Dillon on a phony space mission. Commander Adama and teenage genius Dr. Zee board an incredible new antigravity spaceship. A Galactican shuttle-craft filled with children is attacked by the treacherous Cylons and some of its occupants are forced to flee to Earth. After a lengthy time, the Cylons are back with a basestar that looks to block the Galactica's path. Tired of running, Adama decides to go on the offensive and concocts a plan to attack and destroy the looming Cylon menace. When Starbuck enlists Apollo's aid in rekindling an old flame, their personal mission becomes embroiled in a life-or-death struggle for control of a battle-star ruled by the iron-fisted Commander Kronus. In "Take the Celestra,? Starbuck is unexpectedly reunited with Aurora, his long-lost love, during a Colonial government tribute for Kronus, a hard-nosed veteran of the emigrant space fleet. Aurora rejects her old suitor's renewed advances and, following the ceremonies aboard the starship Galactica, returns with Kronus to his battlestar, the Celestra. Starbuck and Apollo pursue Aurora as she returns to her home base, where a mutiny by freedom fighters and a power-hungry junior officer threaten the ship's command and endanger their lives. Apollo has a routine patrol interrupted and finds himself on a strange world where he is treated as if he is an entirely different person. Even as he wonders whether this world is the Earth the fleet has been searching for, Apollo tries to stop an all out war between rival factions that would destroy much of the population. Baltar, with the help of fellow prisoners, organizes a takeover of the prison barge with the idea of fleeing the Galactica and taking personal revenge in the process. Starbuck, Apollo and Sheba take the people from the sleeper ship to the planet they were heading, a farming planet. Once they arrive they find themselves with a new threat called the Eastern Alliance, a Nazi like society who is intent on destroying them. While on patrol Apollo and Starbuck find a primitive ships carrying a family of a man, woman and 4 children. Speculation soon spread around the fleet that the mysterious people they have found are from Earth but is that who they really are? After a popular sporting event one of the members in the team Starbuck was playing and his main rival is found dead. Starbuck is the main suspect and Apollo is the only one who believes him and must prove his is innocent. Count Iblis continues to gain popularity with the Council for delivering Baltar to them. Adama continues to think there is more to him that what he is telling them. Apollo, Starbuck and Sheba return to the planet and investigate the crashed ship. The fleet is attacked by glowing lights, which are traveling past them much faster than they can follow. Apollo, Starbuck and Sheba find the remains of a spaceship. They find a man named Count Iblis at the wreck and he helps them capture Baltar. After a Cylon kamikaze attack on the Galactica, it is burning in space. Their is no way to extinguish the fire that has already killed many and has left Boomer, Athena, Boxey and many others trapped in the rec room. The only way to free them is via a dangerous spacewalk by Apollo and Starbuck. The commander of the Pegasus, Commander Cain makes the Galactica join in on a full out attack against the Cylons. Adama is unsure about it because he believes the plan to be a suicide mission and will destroy the lives of the entire fleet. On a patrol Starbuck and Apollo are amazed to discover that the Battlestar Pegasus which they assumed was destroyed. The Pegasus is commanded by Commander Cain who is a living legend for many people in the fleet. When Starbuck crash lands on the planet Atilla, where the Cylon's have destroyed all humans except for several children. The children hunt the Cylon's as warriors in order to free their father who the Cylon's hold in their fort. With the help of Starbuck will they be able to free him? After a Cylon attack much of the fleets food supply was destroyed so they must find a planet in which to trade. They land on a farming planet which is plagued by small pig like animals called Borays. Will the team be able to overcome the Borays and get the food they need. The team of commandos which include several prisoners land on the planet in order to destroy the cannon. The get help from a group of people that serve the Cylon's in order to help destroy. They realize that a human is helping the Cylon's by making technology for them. The team manages to get his help in order to destroy the gun. Apollo's ship is damaged and he is forced to land on a Baron farming planet. A young boy finds him and he is then taken to a farm house where he spends the next few days with the boy and his mother. Apollo soon learns that there is a lost Cylon working for a man and must find a way to destroy him so that he will stop causing problems with the other farmers. Adama continues to lead the rag-tag rebel fleet towards the planet Kobol where he hopes to find clues on how to reach earth. Starbuck is captured by the Cylons in order to force a truce plot by Baltar who is now working for the Cylon's. Starbuck and Apollo when on patrol discover a huge void in space. Adama wishes to go through it as he remembers in an ancient book it says it is on the way to earth. Boomer discovers a Cylon listening post on an asteroid and when he and Jolly return they are both dizzy, Boomer skips decontamination to go to Apollo's bachelor's send-off party and end up making all the pilots sick. Most of the fleet's population, along with the Viper pilots, relax at the casino on Carillon. Adama thinks that the Cylons are using Carillon as a trap and suspects an imminent attack but none of the council members believe him. The fleet stops on the planet Carillon to pick up supplies and fuel so they can continue on their journey. Adama thinks something is wrong and a newly elected Council member seize power from Adama. Battlestar Galactica Classic is currently available to watch and stream on ABC. 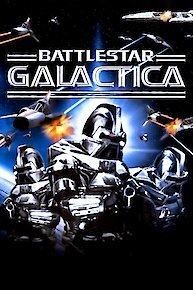 You can also buy, rent Battlestar Galactica Classic on demand at Amazon, Vudu online.